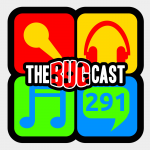 This week on The Bugcast: a sad loss, new furniture, vocal noise, and our usual awesome mix of music! Dave singing in public – oh noes! The next show will be episode 292, which will be broadcast live in the chatroom on Friday 13 December 2013 from 21:30 UK time (UTC).